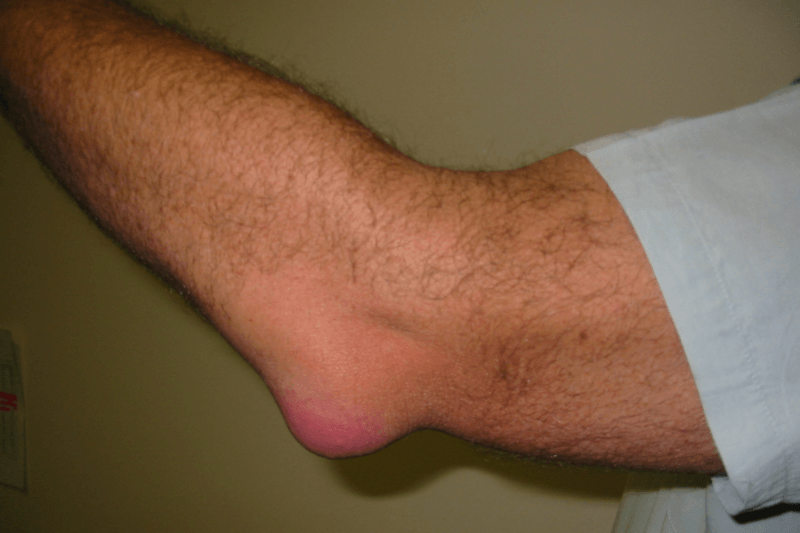 Olecranon bursitis is a relatively common condition in men between the ages of thirty and sixty, although it can occur in both sexes at any age. Learn more about this condition, and how Michigan Surgery Specialists can help. Are there non-surgical treatments for olecranon bursitis? What is olecranon bursitis surgery? The pointy bone located on the tip of the elbow is known as the olecranon. The thin sac of fluid that is positioned between the skin of the arm and that bony tip of the elbow is called the bursa. The function of the bursa is to ensure the skin moved smoothly over the bone as the elbow is bent and extended. A healthy bursa only has a small amount of fluid inside, so it is able to lay flat against the skin and bone, but if this sac becomes inflamed, it will fill with extra fluid causing painful swelling. This swelling of the bursa is called Olecranon Bursitis. There are several different things that can lead to the condition. The most common is trauma. When a person hits the elbow on something or falls onto the tip of the elbow, it can lead to it becoming inflamed. The act of leaning on the elbow while propped on a hard surface like a table or desk can also cause the problem to develop. An infection can also lead to the swelling of the bursa, a simple scratch or cut on the elbow can cause the bursa to become infected and develop into olecranon bursitis. In addition to trauma, there are some chronic conditions that can lead to olecranon bursitis. Gout and rheumatoid arthritis are often the cause, and those undergoing kidney dialysis are more predisposed to develop the condition. There are four main symptoms that a person may notice when they are afflicted with this condition. Swelling. Generally, the first symptom that is noticed is swelling. In the elderly or those with looser skin, the swelling may be quite pronounced before it becomes overtly noticeable. Whether it comes on slowly or flares quickly, the swelling can eventually get quite big and look like there is a golf ball at the elbow tip. Pain. As the swelling starts and the bursa stretches, it can become quite painful especially when the elbow is being bent. During extension, the pain will generally disappear, however. Although some people do not feel any pain at all even if the elbow is flexed. Redness. As the bursa swells, the area around the elbow can begin to look red. This is generally a sign that the olecranon bursitis is due to an infection. Heat. Like the redness, if the area around the tip of the elbow feels warm to the touch, it could be a sign of infection. Pus. If the tip of the elbow is red and inflamed, it might also drain a thick cloudy fluid that is white or yellow in color. This is another sign that the bursa is infected. The elbow and the swollen bursa should be protected by either wrapping the area or wearing an elbow pad. This will prevent further trauma to the area which could exacerbate the issue. The doctor will likely suggest that you discontinue any activity that would lead to direct pressure being placed on the elbow like leaning on your elbows while sitting at a table or arm-wrestling. You may be asked to take a medication like ibuprofen that contains anti-inflammatories, or you may be prescribed something stronger. If the bursitis is due to an infection, the doctor will likely add a round of oral antibiotics to the treatment plan. If the less invasive treatment options do not show any signs of helping over the span of three to four weeks, the doctor may suggest the draining of the bursa and an injection of a corticosteroid. Generally, saved until all other methods have failed, the surgical removal of the bursa may be recommended. In this procedure, called a Olecranon Bursa Resection, the surgeon removes the fluid-filled sac and any bone spurs. The surgery can be performed arthroscopically or with a traditional incision. After surgery, you will likely have to wear a splint to immobilize your arm. In some cases you may be referred for physical therapy. You may be able to return to full activity after 3 to 4 weeks. If you think that you may be suffering from olecranon bursitis, contact Michigan Surgery Specialists. Our expert doctors will be able to diagnose and treat your condition, giving you less pain and more mobility. Contact us today!